It is said that Argentines are born linked to football, tango and Argentine asado (roast), although not really know the pecking order. 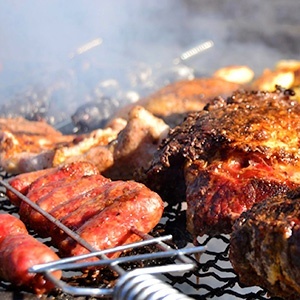 The Argentine asado (barbecue) originated in cattle occupied the vast plains of the Pampas, where it was originally enjoyed by the “gauchos”. Over time, this peasant dish was adopted as an habit in every home. And now, in the houses, the grill has a place of honor. It’s certainly far from “fast food”. Definitely not a dish that is served quickly. It takes its process. And the diner should expect the optimal time, patiently waiting for the grill master or host serves the pieces on the table at the right time. Perhaps this is the reason that the meetings around a roast last several hours of preparation, tasting and conversations. The grilled meets the familial group and friends to mark any celebration and any excuse is good, so that Argentines are big meat eaters. The technical team of E M Combustion Argentina could enjoy the hospitality, savoring our stay in Rio Turbio, where we supplied two 11,500 GLO combination burners and have implemented the auxiliary boiler for starting the power plant.